And Who Needs and Elder Law Attorney? Elder law is a catchall phrase for the various legal issues facing seniors and their families. It includes things like estate planning, probate, guardianship, real estate and a dozen other areas of law. In reality, Elder law is such a broad topic that no one lawyer is able to specialize in all aspects of the topic. The goal of most elder law attorneys is to know several topics very well, and to have access to lawyers with experience in the other areas. Small firms often have several attorneys that handle different categories. Here are some of issues elder law attorneys handle. Most people are familiar with estate planning. It involves the preparation of documents necessary to pass your estate to your heirs. Typically it involves the preparation of a will or trust agreement. Common goals of an estate plan are avoiding estate tax, avoiding probate and ensuring that assets go to the right people or organizations. It can range from simple and inexpensive to quite complex, depending on the estate. When a person dies, the court system has a method for processing the estate. This process is called probate. Probate involves gathering all of the assets of the estate, paying all of the debts and distributing the balance to the heirs. It is a useful process, but it can be expensive and time consuming. As a result, a common goal of estate planning is to avoid probate altogether. This can be accomplished through a living trust, although there are other approaches as well. Nursing home care is very expensive, and it is not covered by Medicare. If you run out of money, it can sometimes be paid for by Medicaid (public aid). In order to qualify, however, you must be almost completely out of money and you cannot give away your money just to qualify. The situation can be more complicated if one partner in a marriage is in good health and the other needs nursing home care. The rules for how much money you can keep or protect and the circumstances under which you can do that, are complex. Elder law attorneys are often able to help families to plan how to get the best possible care for seniors. Advance directives are documents that state what you would like done if you became unable to make decisions during your lifetime. Originally, the only advance directive was a “living will” which allowed a person to state whether they would want life sustaining treatment if they had a terminal and incurable illness. The most common advance directive is a Durable Power of Attorney. Durable Powers allow an individual to name an agent to make health or financial decisions for them if they became unable to do so. They are inexpensive to prepare and probably the most important legal document clients need (and often do not have). When a person becomes unable to make decisions, the courts will look to their advance directives to see who should make decisions for them. If the person has not prepared an advance directive, the court must appoint somebody to do it. This person is called a guardian. The probate courts appoint guardians and monitor their care of disabled people. Guardianship can be relatively simple, when everybody agrees that a guardian is needed, and everybody agrees who the guardian should be. When families disagree about these questions, it can become highly contested. The best way to avoid guardianship is to prepare advance directives. Unfortunately, many people never get around to doing this, and guardianship becomes a necessity. For many people, a time will come when family can no longer provide the type of medical care they need. Nursing home care can be the best (and sometimes the only option). Providing care for the elderly is a huge responsibility, and many nursing homes take it seriously. Unfortunately, there are also nursing homes that do not. Medical errors can cause devastating injuries to nursing home residents including bed sores, fractured bones, overwhelming infections and death. Nursing home neglect cases are handled by litigation attorneys, but they are different than routine personal injury cases. In order to effectively handle these cases, the lawyers need to be familiar with common illnesses and ailments of the elderly – and the many regulations that apply to nursing homes. There are a variety of living arrangements available for the elderly today. They include independent living – senior communities, assisted living, skilled care and a variety of other permutations. What they all have in common is that they involve a transition from a house or apartment. The transition involves selling real estate, selling personal items and signing care contracts (sometimes long term contracts). Each of these transactions can be a huge financial decision. Under ideal circumstances, this transition may occur when everybody is healthy and sound. Often, though, the decisions happen in a rush and after dementia or other issues have crept into the picture. A good elder law attorney can guide you through the process. There are a number of other issues that elder law attorneys may deal with. Hoarding is not necessarily a disease of senior citizens, but it tends to become more prevalent with age. 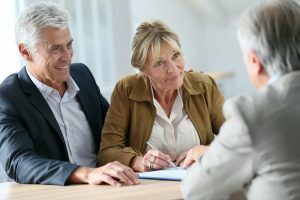 Tax issues, building code violations, contractor disputes and a variety of other legal issues can be common among elderly clients. The one essential skill that elder law attorneys must possess is an ability to listen to their clients. The issues that elder lawyers address are very personal. As a result, the decisions involve difficult and often emotional issues. Elder lawyers have the job of understanding what is at stake and then taking steps to address the situation. Eric Parker is an attorney with the law firm of Stotis & Baird, Chartered. Eric’s office is in Chicago, but he routinely meets with clients in the Chicago suburbs, including Evanston, Wilmette, Skokie, Glenview Lincolnwood and others. The firm represents families in estate, probate, guardianship, wills, trusts and elder law matters. You can reach Eric at eparker@stotis-baird.com. Get more information about the firm at www.stotisandbaird.com.